“Properly prepared, meat stocks are extremely nutritious, containing the minerals of bone, cartilage, marrow and vegetables as electrolytes, a form that is easy to assimilate. Acidic wine or vinegar added during cooking helps to draw minerals, particularly calcium, magnesium and potassium, into the broth” states Sally Fallon in Nourishing Traditions. Place chicken or chicken pieces in a large stainless steel pot (or crockpot on low for 12-24 hours) with water, vinegar and all vegetables except parsley. Bring to a boil. Once it boils, reduce heat, cover and simmer for 6 to 24 hours. The longer you cook the stock, the richer, more flavorful, and healthier it will be. About 10 minutes before finishing the stock, add parsley. This will impart additional mineral ions to the broth. Remove whole chickens or pieces with a slotted spoon. If you are using a whole chicken, let cool and remove chicken meat from the carcass. Reserve for other uses, such as chicken salads, enchiladas, sandwiches or curries. (The skin and smaller bones, which will be very soft if you cooked for 24 hours, may be given to your dog or cat.) Strain the stock into a large bowl. This can now be made into soups or just used as a nutrient dense broth for sipping. We often add a little miso just before serving. 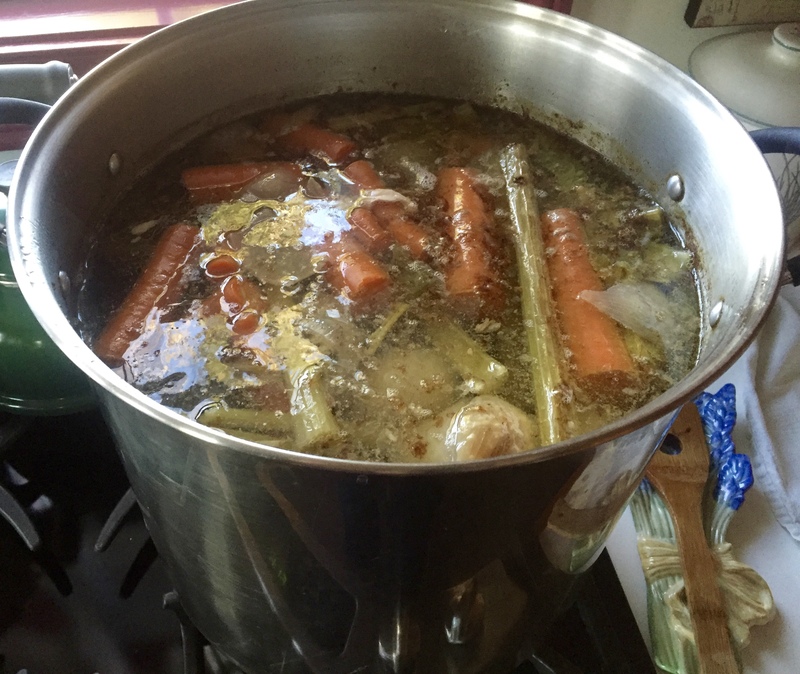 We use bone broth instead of water when cooking rice or quiona for the added nutritional benefits and rich taste. You can add chopped burdock root (fresh or dried), chopped dandelion roots (fresh or dried), 5-7 small slices of dried astragalus root, or Shiitake or Reishi mushrooms to your soup for added medicinal immune support. All of these items or just one of each can be added to your soup pot while you are cooking down the bones. MISO – a fermented soybean paste has many medicinal benefits and can be added to your bone broth just prior to eating. Caution, do not heat your miso under a high heat because it will destroy much of the nutritional benefits of the beneficial microorganisms. Medicinal Benefits of Miso: It is a warming food that travels to the stomach, spleen, and kidney meridians. An anticarcinogen, it tonifies the blood and reduces the effects of radiation, smoking, air pollution, and other environmental toxins. Miso is an extremely nutritive food that aids digestions. The longer fermented misos are the better varieties. The best miso is unpasteurized and naturally fermented and is usually found in the refrigerator section. Miso can be kept indefinitely in the refrigerator. Our favorites are South River sweet white ( a traditional soybean miso), South River Dandelion Leek Miso, and South River Garlic Red Pepper Miso (fermented chick pea miso). How much miso should one eat? Less is more! Eat small amounts 2 teaspoons a day versus a large sum once a week is best. So frequent small meals that include small amounts of miso will give you your best health benefits. Note: Pasture Raised Chicken, burdock root, dandelion root, astragalus root, and South River Misos are all available at the Forrest Green Farm Store.